So far our character interviews have been attracting a rather varied mix of…erm…people…with aliens and big feet popping onto the blog for a chat. We’ve got some more interesting ones scheduled throughout March and April – then a whole month of author mini-interviews as part of our Indie Author Month. Q: Hello Pike, welcome to Aside from Writing, it’s great to have you here today. It’s not every day that we can welcome a bona fide visitor from the New Dawn to our site – or our era, for that matter. Can you tell us a little about yourself and, maybe, what the New Dawn actually is? A: Me? Well, I’m in my sixteenth year and up until the longest day I had no idea we were even in the New Dawn. I was happily assisting Molag the Melon Mogul to harvest his crop of juicy watermelons, but I had a memory: many years before, my mother sent me to the Fertility Stone of Ooze – Ooze being the name of my village – and there I met Moorlock the Warlock. He told me that I was the one who was chosen and that I must return there on my sixteenth birthday – the longest day of the year. Apparently, the New Dawn comes after the destruction of most of the world. Ancient Magicks resurfaced and the technology you know is all but gone. Certain fallen wizards and despot tyrants want to rediscover the bad technology and use it along with dirty magicks to merge our world with the demonic one and to gain ultimate power. Q: A quest? What did that involve? A: A sparrow, a horse and a tub of moisturising cream, mostly. Q: That just sounds bizarre. A: It was. You see, horses are gifts from the gods. No one owns them, no one rides them, yet there I was befriending one and riding on its back, with his permission. I’d never have done it if Robyn hadn’t made me. Q: Robyn, who’s Robyn? I thought you said you were with a sparrow? A: Yes, a sparrow called Robyn. Robyn Fynch, actually. Q: So, Robyn persuaded you, and the horse gave you his permission? A: Yep. That about sums it up. Did I mention they can talk to me, and that I can talk to them? Q: No. I suppose the horse is call Mule, or Donkey, or something? A: Don’t be stupid, he’s called Horse. Q: OK…What are actually happens on the quest then? A: Quite a lot: we get captured by Lord Nairy du Well – otherwise known as the Lisping Lord. He finds out about my riding of Horse and decides that he’s going to supply me with an army to continue my quest on the agreement that I train his troops to capture and ride horses as well. I had to agree, but had no intention of keeping my side of the bargain. Then he sent out a huntress to track us – Scarlet Deadnight. She nearly succeeded in stopping me. I don’t understand why he did that after supplying me with troops. Maybe I’ll find out in the future. Q: What were the most challenging aspects of your Quest? A: Mostly it was all a nightmare: the Stinking Peat Bogs of Lanklandishire were tough, giant sabre-toothed worms, one-eye winglekrats, treachery, man-eating flowers … and then there was the Fair Maiden. Q: Ah, there’s always a fair maiden. A: Yes there is. But this one was central to my quest: I was to win the heart of the fair Maiden and rescue Moorlock from the clutches of his arch enemy. Q: And how did that work out for you? A: Well, I found out that things weren’t quite what I had been told. The Fair Maiden, for example: not what I was expecting, and certainly not fair … nor a maiden. If you want to know the rest I suggest you read the book and find out; my biographer, K J Bennett, did quite a good job, you know? Q: And you mentioned moisturiser: what’s that all about? A: I have this really bad skin condition, and du Well’s handmaiden sorted it out with a moisturiser. I didn’t know that it also had magical properties, which would come in very useful. Q: We’ve got some random questions for you now about books – hopefully you’ll have learned enough stuff from the 20th and 21st century to be able to answer them. A: In the New Dawn we don’t have books for pleasure. I was given a copy of the Great Book during my quest, but that was full of esoteric stuff. I do rather fancy myself as a dashing hero, but I’m more of a dashed one! A: K J Bennett showed me the Lord of the Rings movie. Hobbiton – or the Shire generally – is a bit like Ooze, except for the hairy feet. I like the look of that place. A: That big eye thing in LotR. 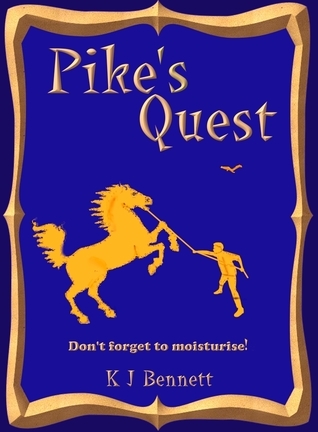 Pike’s Quest, by K J Bennett, is currently available as a Kindle e-book. Want to know more about the book and the author? Check out the links! This entry was posted in Character Interviews, Interviews and tagged character interview, Pike, Pike's quest. Bookmark the permalink.